Positive impacts: sustainability in events | Nadine Dereza is an award winning journalist, experienced business presenter, conference host and co-author of 'Insider Secrets of Public Speaking'. | Nadine Dereza is an award winning journalist, experienced business presenter, conference host and co-author of 'Insider Secrets of Public Speaking'. Taking care of the planet is a bit like any good habit: you diligently recycle the papers and sort out the plastics, but once in a while, you’re working late, it’s bin day tomorrow… and those black bags are opaque, aren’t they? Most of us try to do the right thing, and let ourselves off the hook for special occasions. But what if you work in events, where every day is by definition a ‘special occasion’? Sustainability doesn’t necessarily sit happily with venues. On the first day of the holiday, walking into the bathroom, the last thing you want to see as you leave your cares behind you, is the little printed note reminding you that your fluffy new towel comes at an environmental cost. Five star luxury is contrary to a green lifestyle. If you want to hug a tree, holiday in a tipi. But conferences are work, and work isn’t a holiday, even if the bedroom looks over a golf course. 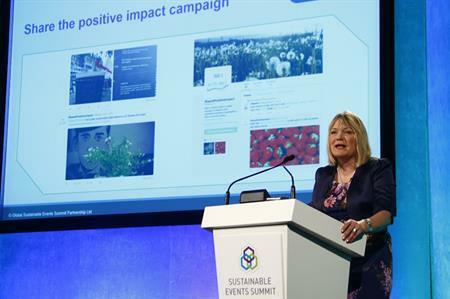 PS Programmes’s own Nadine Dereza was chairing the Global Sustainable Events Summit this year at the QE11 Centre in London, addressing just the sorts of issues that the events industry is facing. closed the Summit with a strong emphasis on leadership. After all, Daniel was responsible for the 2012 Olympic marketing and communications, as well as being a leading figure in the campaigns of both David Cameron and Boris Johnson. From the very beginnings of London’s Olympic bid, ‘sustainability’ went hand-in-hand with ‘legacy’, and Daniel demonstrated that CSR (corporate social responsibility) has moved from being a trend to the mainstream. Positive Impact themselves are showing leadership by – among other things – throwing their weight behind an industry-wide pledge to reduce carbon emissions. The pledge is currently in draft form, with the opportunity for event organisers to have their say in the run up to December’s UNFCCC COP21 Climate Change conference in Paris. So how do people become leaders within the area of sustainability? Education is crucial, and as a first step, Positive Impact offers training in this area. Chris Hines, for many the stand-out speaker of the day, also provided by Speakers Corner, was a great example of grassroots activism tapping into the bigger picture. Spearheading the ‘Surfers Against Sewage’ campaign, Chris has helped put the quality of the UK’s coastal waters on the political agenda in a way that’s relevant, powerful and dare we say it, cool (not that we are arbiters of cool). Taking us back to the ‘good habits’ analogy at the top of this blog, one of the practical actions recommended by Positive Impact was to make sure attendees eat properly through events – which means fresh and healthy food, not just bulk pastry to fill people up and gallons of caffeine to keep them going through the afternoon. Goodness knows it can be hard to walk past the hotplate of bacon to reach the porridge counter at a breakfast buffet, but we all know it’s worth doing. At the conference, delegates were able to hear from event industry insiders talking about the practicalities of hosting large-scale events. Chelli Easson talked about the challenges and opportunities of implementing ISO 20121 in the run up to the Gold Coast 2018 Commonwealth Games, and Ben Chambers of Eve Trakway reminded us all that it’s festival season with his discussion of practical sustainability at the Glastonbury Festival (which goes beyond getting mud out of your sleeping bag). But perhaps most movingly, Nadine conducted a Skype interview with Furba, a trek leader in Nepal, whose livelihood disappeared in the aftermath of the recent earthquake. As uneven as the Skype connection was, his mere presence was enough to create a big impact on the delegates in the room. With hundreds of thousands of survivors traumatised and homeless, and entire villages flattened across the country, this was environmental impact on an unimaginable scale. Incentive travel, which formed the majority of Furba’s work, is yet another aspect of the industry for us all to consider. Sustainability is growing up, and not before time. Action needs to replace words, and hopefully we have seen the back of the days when retired politicians get paid six figures to travel the globe in private jets to tell hard-working audiences not to have their two weeks in Spain. From the conference, we had a clear vision of the next steps for the industry. Sharing success isn’t just about feeling good, it’s an important way of making people realise they are not just one person switching off a light – small actions can have a big impact. It’s also important for leaders to identify themselves, have a plan, measure progress and educate themselves and their teams. Effective communication is essential for this. Sustainability – and the environmental movement in general – has a habit of working in big numbers, enormous statistics, and at a scale most people cannot easily understand. If you want to get your business and your people on the sustainability bus, you will have to take a leaf from Chris Hines’s book and sure you are telling stories with heart, rather than repeating doom and gloom statistics which make people feel powerless. Above all, it seems that advocacy is the number one factor for promoting sustainability: climate change isn’t something individuals can tackle by themselves – so why should one person change their behaviour? Advocacy helps people understand that their small actions are part of a bigger picture. Sustainability is no longer simply a ‘nice to have’; it is the foundation of creating an event, and on which the industry leaders of tomorrow will thrive. As Daniel Ritterband said, sustainability is the future. The current events industry can lead the way – or expect to be overtaken by a whole new industry that will leave out of touch companies far behind.